Only 1 unit left This is a turn key project to the East Marbella and is the next stage after the success of phase 1, it is a natural extension comprising of 35 off plan luxury contemporary independent 3,4 and 5 bedroomed villas now completed. 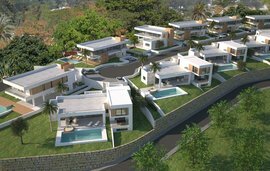 This is a turn key project to the East Marbella and is the next stage after the success of phase 1, it is a natural extension comprising of 35 off plan luxury contemporary independent 3,4 and 5 bedroomed villas now completed. These beautifully designed villas offer modern family living with large open plan areas and an abundance of light and space. 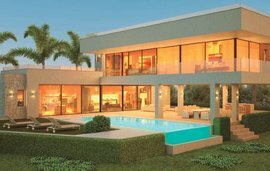 These magnificent, modern properties will be built to a very high standard, and such is the demand for this style of property in Marbella that phase 1 sold out within three months. Phase 2 only has one villa left. With competitive prices starting from 925,000 and ranging to 1,463,000 it is very easy to see why these villas are so popular and desirable. This development is located in a beautifully green area to the West Marbella and it is ideally situated close to the international schools, local amenities, superb beaches and beach bars, shopping centres, golf courses and only 5 minutes away from the centre of Marbella town with its excellent shopping areas and restaurants. All villas have private pools, 24 hour security and has access to a private Clubhouse and spa with Jacuzzi, sauna, gymnasium and lounge area. The development is designed to combine a sleek architectural language with a peaceful natural setting surrounded by olive groves. Buyers can select between two main villa designs with variations on the layout of the kitchen and the number of bedrooms allowing the buyer to have that desirable bespoke quality. This new phase also introduces a 5 bedroom villa to meet unique specifications from the buyer.